A few weeks ago my friend Melissa informed me she was driving back to Minnesota (her home state) and then on to Chicago at the end of the month. We got to talking about me coming with her to be her road trip companion. Then it dawned on me – if we were going to Minnesota, that meant it wouldn’t be too big a detour to swing up through the north west – to most of the 8 states left on my list! Today I booked my return flight from Chicago – and our itinerary is set. It will include Idaho, Montana, North Dakotah, South Dakotah, Minnesota and Wisconsin – so by the end of May I will have crossed every state off my list besides Oregon and Alaska. Oregon will be easy – I even started planning a little road trip up there to Portland months before this trip with Melissa. So Portland is going to happen sometime in the next few months as well. All that leaves is Alaska. Oh, Alaska. I’m going to try and make it happen. It’s been a lifelong goal that I never thought I’d be able to achieve at only 25 yrs old. It’s also a pretty awesome milestone for any traveler. 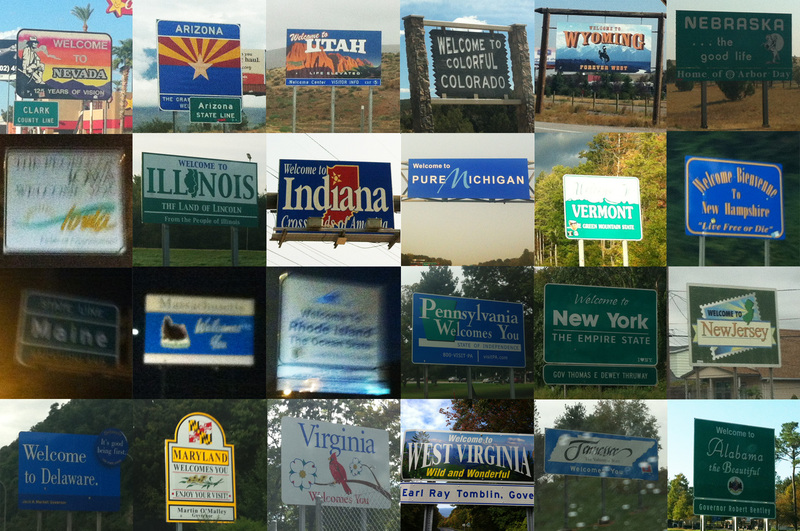 Here’s some of the state sign photos I’ve been able to capture over the years. Mostly on my iPhone so pardon the horrible quality!